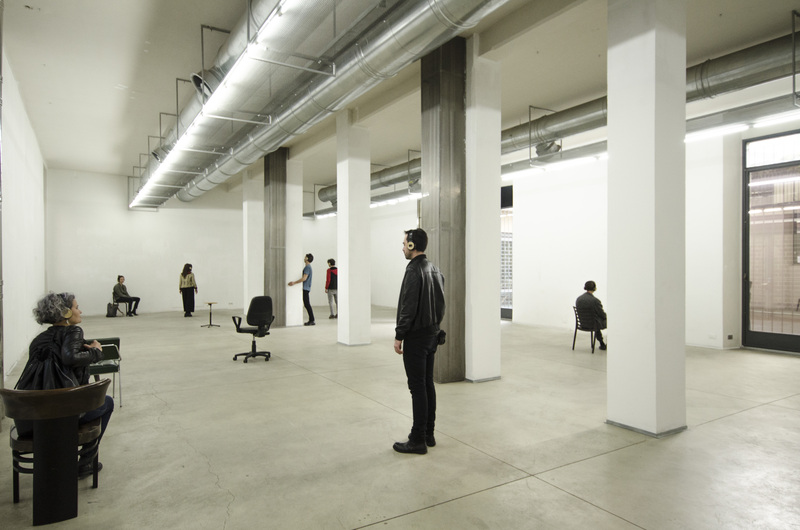 The action, made by Hannes Egger on Barriera’s Body, turned the opening of the exhibition into a collective performance inside the exhibition space. A voice-over personally addressed every single spectator through the headphones given at the entrance. The work aimed to create a direct interaction between the space and the body of the visitor, who was asked to embrace a dynamic and performative role rather than a static and contemplative one. While experiencing the crossing of the void through See the invisible, a series of references taken from the history of art appeared. They were recalled by the narrator and “moved” by the public, whose imaginative capacity was constantly tickled. of the neighborhood itself, whose industrial past is less and less known because of the process of gentrification that took shape in recent years.